'Three studies from the Temeraire' is an oil on canvas triptych, painted between 1998-99. The history is of special interest, unusual yet evolutionary. In 1998 Twombly was working on three related but at the time independent canvases on three adjacent walls of his Gaeta studio. The theme was these ancient vessels and all the senses of myth and history they inferred - there was originally neither particular thought of Turner, an artist who he had always especially admired, nor of the three panels as a single work. Gradually they coalesced into a single epic event and were shown in the National Gallery in London in the exhibition "Encounters: new art from old" in the year 2000 alongside Turner's famed 'The Fighting Temeraire tugged to her last berth to be broken up, 1838', which was painted in 1839. The theme of this exhibition was 'great artists of our time converse with the greatest artists of all time'... and of course Twombly's pictures assumed their role as contemporary evocations of Turner's 'The Fighting Temeraire'. Looking at the three canvases together, as a single panorama, there is a potent sense of passage as the ships drift, float and sail into the warm, sensuous but slightly ominous embrace of infinity. There is a strong sense of procession, with the flag-ship bringing up the rear, or maybe they are all images of the same ship, passing into history. This 'dissolving' fleet is a poignant echo of Turner's 'Temeraire' as she is towed by a tugboat to her last resting place in the cooling glows of a fast descending sunset. 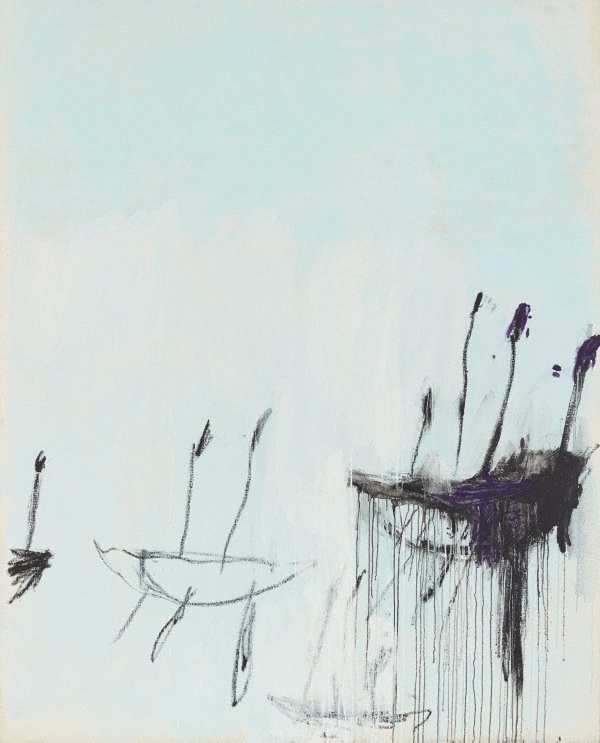 Both Twombly's and Turner's paintings are dominated by sky and water, indistinguishable in Twombly, but both elements in which things can float. There is too a wonderful correspondence between the emotive reflections in Turner's 'Temeraire' and the dripping lines that that flow from Twombly's apparently doomed ships. The qualities and sensibilities which echo from Twombly's 'Three studies from the Temeraire' are manifold: the imagery suggests the passage of time, the inevitable end to any voyage, the passage from the present to the past and vice versa. These works imply that continuity of human, cultural and aesthetic experience in which the past is always available, as Twombly so believes. His passing, disappearing fleet may indeed also symbolise that unbroken chord which links classical antiquity with the present. Twombly's 'Three studies' would never have been inspired as they were, or painted as they were, without Turner's 'Fighting Temeraire', even though they were initiated without any such specific association. Certainly they are far from slavish copies or shallow contemporary imitations. 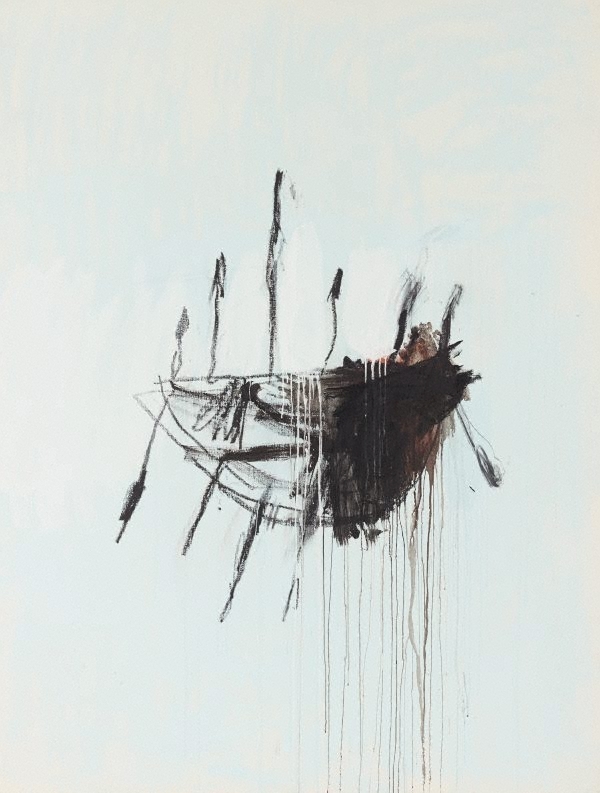 It is likely that Twombly's modern interpretation would confuse a latter-day Turner, however he would have recognised certain qualities - the fascination with the aura of the heroic, the melancholy and beauty of passage, the magic of profound light, the evocation of depth, profundity and mystery. Cy Twombly was born in 1928 in Lexington, Virginia. In 1948-49 he trained at the School of the Museum of Fine Arts, Boston; he then won a Fellowship to the Art Students League in New York where he forged a close association with fellow student, Robert Rauschenberg. They subsequently attended the progressive Black Mountain College in North Carolina where they studied under Robert Motherwell. In 1952 Twombly won a grant to visit Europe and, with Rauschenberg in tow, they travelled extensively returning to New York in 1953. In 1957 Twombly left New York for Rome, virtually for good, although he still returns every year to Lexington for a few months. By 1960 Twombly was established and much recognised, especially in his new home Italy, but also in New York where his classically-inspired, highly individual and seemingly subjective marks, doodles and lines - moments of experience set against moody rich and absorbent creamy white grounds - were the very antithesis to the then current vogue for Pop Art and Minimalism. If there was any relationship with New York it was his certain affinity with Abstract Expressionism. These often gently convulsive works gradually calmed into the more austere but nervous, and highly distinctive, 'blackboard' pictures distinguished by the 'scribbles' which became an absolute hallmark of Twombly's work. During the late 1970s and the 1980s Twombly's paintings had a less frenetic sense of pace and energy, and assumed an even more mysterious and contemplative nature. There is a noticeable maturity about these works and an admission of a debt to artists who he particularly admired including Monet and Turner in their mysterious tones and contemplative attitude. He also moved out of Rome to where he presently lives, in the old port town of Gaeta, roughly half way between Rome and Naples. Purchased 2004 with funds provided by the Art Gallery Society of New South Wales and the Art Gallery of New South Wales Foundation, with the assistance of the following major donors: Kerry Packer AC & Roslyn Packer, Jillian Broadbent AO, Peter Weiss AM, Ginny & Leslie Green, Geoff & Vicki Ainsworth, Catriona & Simon Mordant, Susan Rothwell, Ann Corlett, Rowena Danziger AM & Ken Coles AM, Energy Australia, Brian France AM & Philippa France, Chris & Yvonne Gorman, John & Inge Grant, Penelope & Harry Seidler AC OBE, John Symond AM, Isaac & Susan Wakil, and a number of other private individuals. © Cy Twombly Foundation, courtesy Gagosian Gallery, London. 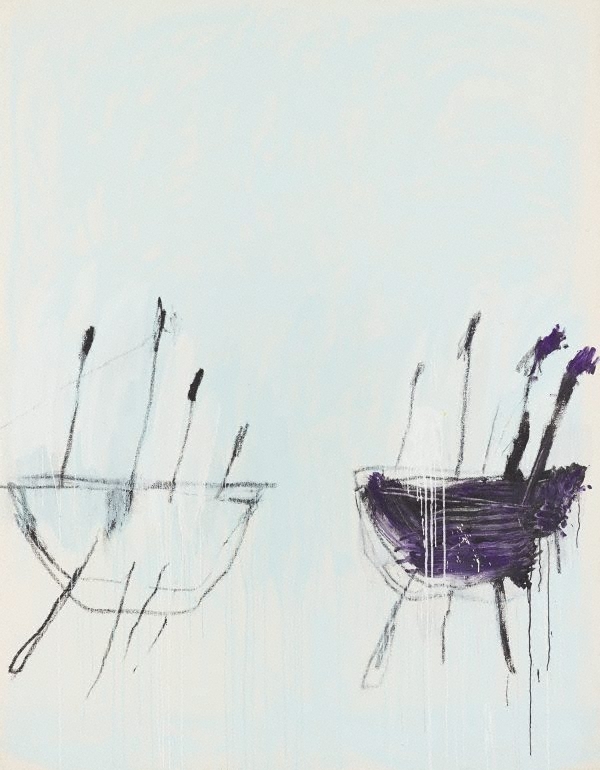 Steve Bush (Editor in Chief), Art World (issue 4) , 'Australia's Twombly', pg. 146, Sydney, Aug 2008-Sep 2008, 146 (colour illus.). Edmund Capon, Look , 'Cy Twombly: a first for Australia in our Gallery collection', pg.20-23, Sydney, Feb 2005, 20, 20-21 (colour illus. ), 22, 23. Betty Churcher, Australian notebooks , 'ART GALLERY OF NEW SOUTH WALES', pg. 45-90, Melbourne, 2014, 73 (illus. ), 74-75 (colour illus. ), 76 (illus. ), 77-78, 255. Illustrations on pg. 73 and 76 are pencil sketches of the work. Glenis Israel, Artwise: visual art 7-10 , 'Chapter 4: Nature and Human Intervention', pg. 133-152, Milton, 2013, 138, 139 (colour illus. ), 300. John Lyons (Editor), The Sydney Morning Herald , 'Blue Poles II: a modern gem or a load of Pollocks' By Lauren Martin, pg.1, Sydney, 17 Nov 2004, front page (colour illus.). Lauren Martin, The Sydney Morning Herald , 'Twombly buy earns high praise', Sydney, 17 Nov 2004, (colour illus.). Encounters: new art from old , London, 2000, 286-287 (colour illus.). Australian museums and galleries', Art and Australia (Vol. 42, No. 4) , 'New acquisitions, pg.600-601, Sydney, Jun 2005-Aug 2005, 600 (colour illus.). Look , 'Members' gallery: the next decade', pg.22-30, Sydney, Jul 2013, 28, 30 (colour illus. ).